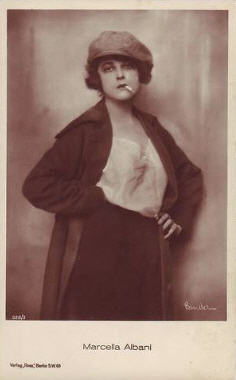 Marcella Albani was born as Aida Maranca. After her final examination at the secondary school he met the Roman aristocrat Guido Parisch who was active in the film business for many years. The couple was abligated to Turin and shot several movies with Parisch as a director and Albani as his star. The most successful movies in those days were "Bufera" (21), "La figlia delle onde" (21) and "Amore in fuga" (21). In 1923 Marcella Albani went to Berlin with Parisch where she carried on her future work from now on. Parisch shot his movies in Germany with his pen name Guido Schamberg. Marcella Albani was accepted by the audience immediately and she celebrate successes with "Frauenschicksal" (23), "Das Spiel der Liebe" (23) and "Im Rausche der Leidenschaft" (23). Her cooperation with Parisch ended in 1926 and instead of it she filmed with famous directors like Joe May, Friedrich Zelnik and Wilhelm Dieterle. Her absolute height she experienced between 1927 and 1929 where her popularita was so big that she was able to film round twenty movies within this three years. Her engagements led her to France, Austria, Czechoslovakia and Italy. With the rise of the sound film she devoted more to the literature. She published several novels, among others "La Citta dell'amore", which was adapted for the screen with her in 1933. Her last movie was "Der Kaiser von Kalifornien" (36) with Luis Trenker who she already met in 1928 when they likewise acted together for the film "Der Kampf am Matterhorn" (26). After that she retired from the film business and lived at the Ligurian coast.